Palin's transparency proposal already exists in D.C.
Sarah Palin says she will bring the same kind of transparency she brought to Alaska to Washington, D.C..
CEDAR RAPIDS, Iowa (CNN) - Sarah Palin likes to tell voters around the country about how she “put the government checkbook online” in Alaska. 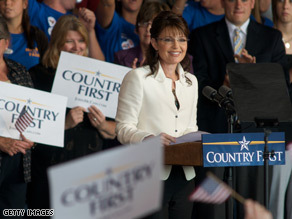 On Thursday, Palin suggested she would take that same proposal to Washington. There’s just one problem with proposing to put the federal checkbook online – somebody’s already done it. His name is Barack Obama. In 2006 and 2007, Obama teamed up with Republican Sen. Tom Coburn to pass the Federal Funding Accountability and Transparency Act, also known as “Google for Government.” The act created a free, searchable web site – USASpending.gov - that discloses to the public all federal grants, contracts, loans and insurance payments. In June of this year, Obama and Coburn introduced new Senate legislation to expand the information available online to include details on earmarks, competitive bidding, criminal activities, audit disputes and other government information. Palin might also have noted that her running mate, John McCain, was an original co-sponsor of the 2006 transparency bill that became law. UPDATE: A campaign spokesperson insisted that Palin was referring not to that specific proposal, but rather to "that kind of transparency in general." Another "oops" for "Senator Deregulator and Governor "I can see Russia". Keep talking Sara...you are single-handedly sinking your own ship. Is My Name Really Sarah? The simple fact that these two clearly aren't taking these election seriously, during a period in our history when chaos rules, proves beyond a reasonable doubt in rational minds they aren't up to the task. How about it Gov Palin. Anymore bright ideas. Next time try to come with a new idea of your own. This one is taken. You would think that McCain.. being a co-sponser of the transparency bill, would've remembered to tell Palin that this law already exists. Whether it's an attempt to lie to the people, or just old age where he forgot it exists... it's scary either way. How can a United States Governor not know about the existence of a Federal Government transparency website. If you add this to her ignorance of the Bush Doctrine then my conclusion is that McCain has short-changed the American people were he to get elected. FYI – Both issues fall under economy and security. People need to cover this on prime time casue many do not know this and fall for the garbage that Obama did nothing in his over 12 year career in public office. Once I researched the records and listened to the lies being spread by republicans the chioce was clear. I refuse to be fooled into another disasterousr 4 years. ENOUGH! She should have known that, just like she should have know the "Bush doctrine"...I guess she's been skipping her homework! DOES PALIN REFUSING TO COOPERATE WITH INVESTOGATORS MATTER? IT MATTERS!!!! With a VP candidacy she’ll be a heartbeat away from the Presidency!!!!!!!!!!!!! IT MATTERS!!! She’s not a Hollywood celebrity she’s vying for the seconf most important office IN THIS COUNTRY!!! YES IT MATTERS!!! IF SHE HAS NOTHING TO HIDE THEN PROVE IT!!!! !